On Sunday, I slept in a little later than I had on Saturday, and took the time to do my hair and put on makeup. I dressed in the same costume as I had the previous afternoon (better, longer tabards, no robe), went downstairs, got coffee and a breakfast sandwich at the Westin’s Starbucks, and made my way over to the Marriott while eating the sandwich. I got a “die, Jedi scum!” from a Sith cosplayer who passed me on the street, which made me smile. I had some time to kill in the Marriott, before our meeting time of 12:30, so I enjoyed my coffee and took more pictures of other cosplayers, which, again, are on my Flickr page. Contestants were told to to meet up at 12:30 outside the Marriott Imperial Ballroom. We were led into the ballroom and lined up on one side of the room, in order of the numbers we’d been assigned at pre-judging. All the contestants were really friendly and talked to each other about their costumes while we were waiting, which made the whole experience a lot of fun. I was in line behind Darth Nihilus (her real name was Jessica), and we had a really nice, long chat about making costumes while waiting in line. Turned out we had both made costumes of the exact same anime character (BT from .hack//SIGN) in the past, so we compared notes on how we’d created each piece of the costume. 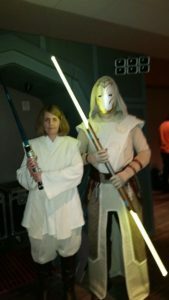 Going on stage and posing with my lightsaber for pictures was a lot of fun. I tried, but I couldn’t completely restrain myself from smiling while I was on stage. I’d wanted to do this for years, and was glad I had seized the moment, jumped in, and done it. I was only the third person in the lineup, so I got to sit and watch everyone else go on stage. While the scores were being tallied, all the contestants stood off to the side of the seating area so people could take pictures of them, and they could take pictures of each other. Finally, it was time for the winners to be called. In this costume contest, there were not only separate awards for each experience level, there were separate awards for each type of character, so that fabric workmanship wouldn’t have to be judged against armor workmanship. I thought that was a great idea. The awards ceremony was perfectly geeky, too – the awards they gave out were modeling-clay replicas of the medals from the ceremony at the end of A New Hope, and they played the music from that scene while they were giving them out, too. I loved it. 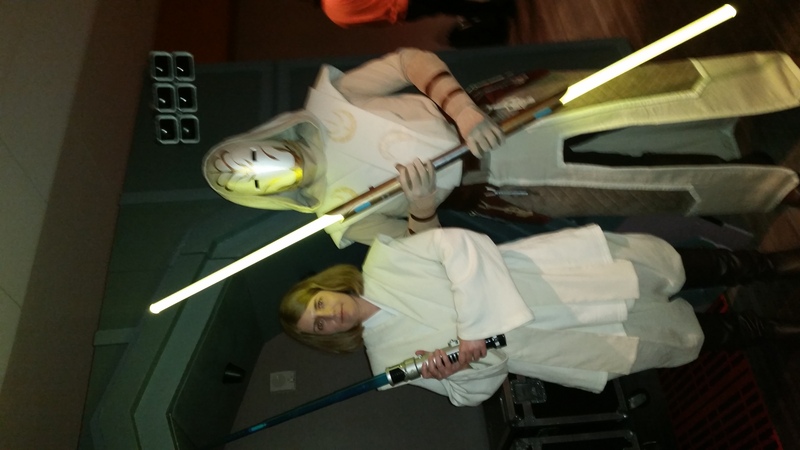 To my complete amazement, my name was called for the best Jedi or Sith costume in the intermediate experience level! I was genuinely surprised and didn’t really feel like I deserved it. Despite the fact that my costume didn’t meet Rebel Legion standards; despite the fact that I hadn’t bothered to make the bottom part of my outer tunic as a separate skirt; despite having no belt pouches; even despite my telescoping plastic toy lightsaber that didn’t even light up, somehow, they still gave me an award. I felt very flattered and validated by this, and was all smiles when the emcee placed the medal around my neck. I knew this meant I had graduated to the next level of cosplay. We hung around and took more pictures after the contest was over. 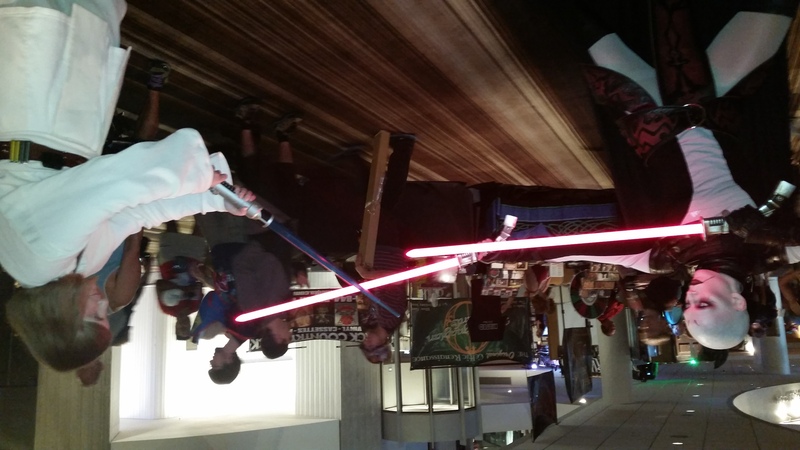 This lady won Judges’ Choice for her awesome Asajj Ventress, and I had to get a combat picture with her. Kid: You fought with Darth Vader! Kid: And then you turned into the Force? Kid: Can I hold your lightsaber? Me: Of course! Let’s take some pictures. 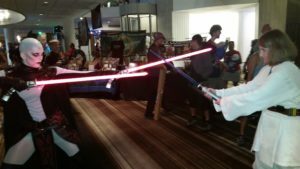 So I let his parents get some pictures of the two of us, with him holding my lightsaber, and then went on my way. As I was walking up the street toward the Westin, I said to myself: That was better than the medal. One of the reasons I cosplay is that I enjoy pretending to be characters that I love. On one of my recent episodes of Thread Snippings, I talked about how a good cosplayer can, on some level, bring your favorite character to life. On that afternoon, for a minute or so, I had the privilege of doing exactly that. To that one kid, I was one of his heroes, live and in person. That, in my estimation, is the greatest honor I could ever earn as a costumer. It was even more meaningful to me than winning the award in the costume contest. Not that I didn’t appreciate the award and feel proud of it. Even though I knew that humility and modesty were the Jedi way, I still wore my medal around my neck for most of the rest of the day, only taking it off for a picture I’ll talk about in my next post.